Polynesian seafarers left Mangareva around AD 800 in search of quality stone for vital tools, and found success on Pitcairn. 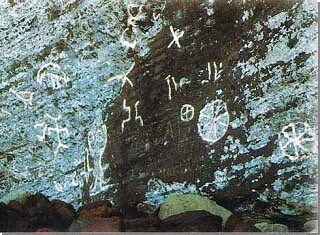 Trade flourished between the islands and settlers made rough stone gods, carved human, animal and geometric images on rock canvasses, created burial sites and left many artefacts. The Bounty mutineers arrived in 1790 and found their temple platforms, petroglyphs and stone tools giving evidence (and confirmed by Marshall Weisler), that Pitcairn had formerly supported an ancient Polynesian population, most probably from Mangareva. The mutineers destroyed most of these “inappropriate” artefacts but left some 300 breadfruit trees. Honore Laval, a 19th century missionary who collected material from Mangareva, found references to Mataki-te-rangi, a traditional island which one of the early chiefs of Mangareva is described as colonising and planting with breadfruit. According to Sharp, “Mataki-te-rangi is described as being ‘like Petania,’ or ‘in truth Petania.” This was the late Mangarevan name for Pitcairn, after both islands - Mangareva and Pitcairn - had been discovered by the Europeans. This has confirmed for many that Mangarevans were the earlier inhabitants of Pitcairn. Jared Diamond writes: “Imagine the excitement when the first canoe load of Mangarevans discovered Pitcairn after several days travel on open ocean, landed at its only feasible beach, scrambled up the steep slopes and came upon Down Rope Quarry, Southeast Polynesia’s sole useable lode of volcanic glass, whose flakes could serve as sharp tools for fine cutting tasks – the Polynesian equivalent of scissors and scalpels. Their excitement would have turned to ecstasy when barely a mile farther west along the coast, they discovered the Tautama lode of fine grained basalt, which became Southeast Polynesia’s biggest quarry for making adzes”.(P123). Of interest Sharp notes that some of the adzes resembled those found in such distant places as Hawaii and Samoa. This is supported (and debated), by archaeological findings on the island, where different workings of the numerous adzes found, may suggest that different people from different points of origin may came to Pitcairn at different times in the past. Pitcairn offered fresh water and also timber for canoe hulls but its limited flat land for agriculture, and rough shoreline with no reef for fishing and shellfish gathering made it rather inhospitable and it probably hosted no more than 100 inhabitants. The reliance on trade faltered with the collapse of Mangareva at its hub, and the whole East Polynesia trade network that had joined Mangareva to Pitcairn, Henderson and other island groups disintegrated. Weisler also added that environmental problems such as deforestation, erosion, extinction of some bird species and the accidental introduction of rats who stowed away on canoes, all contributed to the ending of this early civilisation. Like Henderson, their civilisation crumbled with dwindling resources and loss of trade, leading to Pitcairn’s abandonment during the 16th century. 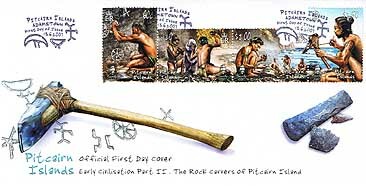 The Pitcairn Islands Philatelic Bureau has drawn on material from Jared Diamond, Marshall Weisler, Andrew Sharp and the Pitcairn Islands Study Circle through Herb Ford, to summarise the early habitation of Pitcairn. The Bureau recognises their contribution in making this issue possible. Marshall Weisler has been conducting archaeological research across the Pacific for almost 30 years. He specialises in the human colonisation of remote islands, investigates how people adapt to new environments and tracks patterns of trade and exchange across East Polynesia. He was project archaeologist for the Sir Peter Scott Commemorative Expedition to the Pitcairn Islands in 1990-92.